So Lindsey at Nancy Clue nominated me for the Liebster award. She is hilarious- like Chelsea Handler status for reals. Plus she is super sweet and gorgeous! Love her blog! So I will be answering her questions now! You must thank the person who nominated you for the award. You must write eleven facts/things/tidbits about yourself. You must answer eleven questions that were given to you from your nominator. You must nominate eleven other bloggers who have 200 or less followers and tag them in your acceptance post. You must create eleven new questions for your nominees to answer in their acceptance post. You must notify your eleven nominees on their blog, so they can accept their award and pay it forward. 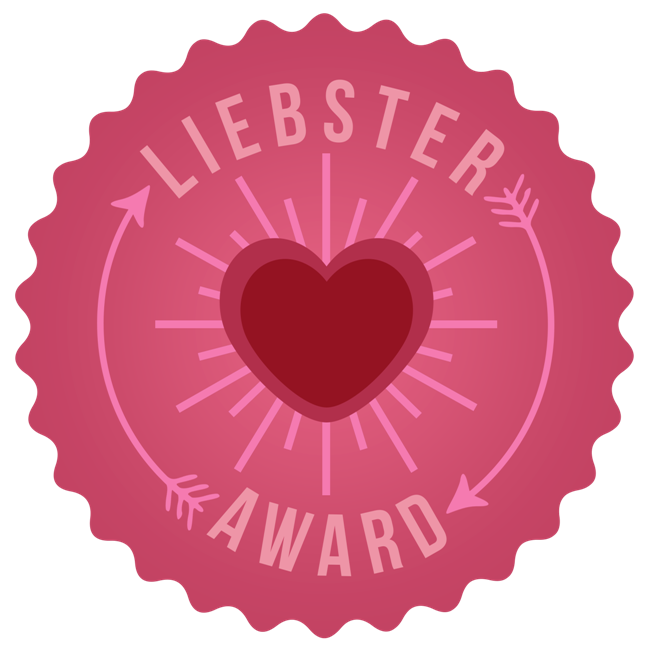 After all of this is done, you may add the Liebster Award Button to your blog. 1. I just graduated from college with a bachelors in writing and a minor in history, health education, and journalism. 2. I did ballet for years, and truly miss it. I was in the Nutcracker once and after I lose these lbs I want to get back into it! 3. I LOVE trashy gossip magazines- I have a subscription to US weekly, People, and Cosmo. Its my weekly treat. 4. I am the pickiest eater on the planet. 5. My favorite date night is going out to dinner- the hubs and I are kind of foodies. 6. I am super sentimental, I save lots of things and always plan out heirlooms for the kids I don't have. 7. I have a long haired chihuahua named Fenix. He rules the house. I adopted him from the Humane Society. 8. I have 1 older brother, who is a chef for a big company. He is insanely talented and creative and could totally win top chef or one of those shows. 9. I am a nanny, that's what I did while going to school. Hopefully I can find something more stable but I love it so much I still will babysit in the evenings. 10. I watch wayyy too many sitcoms. I own all the friends DVDs and could watch them 24/7. 11. I have a hot pink kitchenaid that I got for my bridal shower from my mom. It's my favorite kitchen item. What was your first concert? N'Sync- my brother bought me tickets and took me when they were at the fair. If you were on Death Row, what would be your last meal before you were executed? Mac and Cheese and Fries for sure. If you could invite three people (living or dead) to dinner, who would you choose? I would have to go with my grandpa (I called him papo), who passed away this past June because who wouldn't want to spend one more day with a loved one. My Grandma Joy who passed away when I was young, because I didn't get the opportunity to know her very much. Third would be one of the people I really admire from the blogging world, there are many but they're on my list of people I want to meet. What was your most favorite day ever? I'd have to say my wedding day, mainly because everyone I love was there and it changed my life. There were many special moments that day. What was your first car? My first and only car is a white honda civic. What is your ultimate dream vacation destination? The poseidon in Fiji. When I win the lottery. What is your most embarrassing moment? I'm sure there are many but one doesn't really stick out. What is your biggest pet peeve? Thats a tough one. Probably being flakey because I hate it when people cancel plans. These are all I have that are under 200 followers, but I love all of these blogs! All on my everyday reading list. 1. Who do you most want to meet and why? 2. What is your favorite clothing item you own? 4. What bloggers would you most want to meet? 6. What are two items on your bucket list before you die? 10. Favorite movie or TV show? 11. Best day/event of your life? Holy hell Taber thanks for the nomination gurlfrannnn... I have now been nominated four times today! LOL PS I want a pink kitchenaid mixer dammit! Hey, new follower from the Mingle Monday Blog Hop over at Life of Meg. Awesome blog you have here! I also love reading trash magazines, it's a guilty pleasure of mine. ;) And I have all the Friends DVDs as well, they never get old!